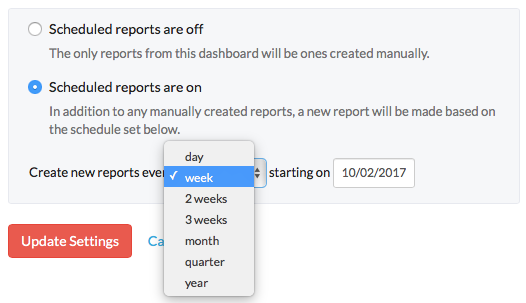 Open the dashboard where you want to schedule reports. Under scheduled reports, select Scheduled reports are on. Enter the frequency and start date for publishing reports. Select Update settings. On the next scheduled date at 8 a.m. (according to the account time settings), a report will be sent to each user who has access to that dashboard. The report will include each metric listed on the dashboard at the time of publication. Note: You must have at least one metric on the dashboard in order to be able to schedule reports. Important: You cannot schedule reports from metrics created with Jama Connect quality coverage or volatility trend metric templates. Placing these metrics on a dashboard disables reports on that dashboard.